This is the story of an attitudinal bunny and the Black Vulture who dared to encroach on her territory. Two years ago I finally caved and told my daughter she could have a rabbit. She had wanted one for a long time, but I was convinced I would end up taking care of it, plus there were carnivorous birds in my house. But Skye wore me down, and in her junior year of high school we went to the local Rabbit Rescue. “How long do rabbits live?” I asked the rescue lady, pulling her aside. “About eight years,” she replied. “Then give us a six-year-old rabbit,” I said, knowing Skye would be heading for college in two years. Miraculously, Skye actually fell in love with a six-year-old Rex. 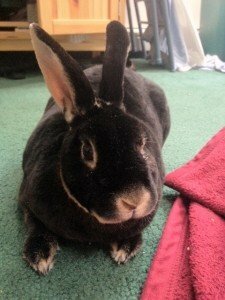 Delilah, as she was eventually christened, had been rescued from a slaughterhouse; she had been languishing in the bunny safehouse for four years, as she was skittish, distrustful, and hated to be held. But she was beautiful – a deep, almost-black brown (called “otter”) with a palomino-colored belly, and jaw-droppingly soft fur. More importantly, she was sad and no one wanted her. Immediate bonding (“bunding”) occurred, and Delilah emerged from her shell with astonishing speed. Soon she was lolling on her back on Skye’s bed, exposing her pale, vulnerable stomach in a way most well-adjusted rabbits refuse to do, let alone ones who have been hauled around by their ears en route to the meat market. Momentarily disconcerted by the sight of our 120-pound dog, she quickly got over it; as soon as she figured out what a pacifist he was, she started charging at him. Drunk with power, she’d stare him down, then chase him out of the room. 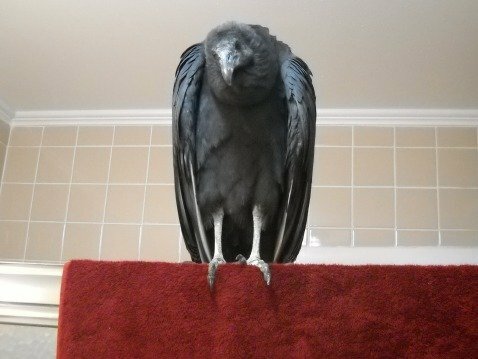 Recently I rescued a juvenile black vulture who had been walking around a retirement community for two days, with no other vultures in sight. He had no fractures or visible injuries. He was incredibly cute. Wildlife rehabilitators all have their own cuteness appreciation levels, and black vultures send me over the top. I thought he might be sore from banging into something, plus he was thin, so I simply planned to let him rest and gain weight in a large crate in our screened-in porch. One day, however, I wanted to transfer him to a temporary crate while I cleaned the big one, but they were all occupied; so I put him on the floor of my shower. I gave his crate a thorough cleaning, then returned to the bathroom to find that he had levitated off the floor and was standing on the shower door. I gaped with surprise; he appeared to shrug, although vultures always appear to be shrugging. The next day I was in a rush. I should mention that Delilah’s “cage” is a very large, PVC-and-mesh enclosure I had originally built for fledgling crows, which (until it gets cold) is also on the screened-in porch. At that particular moment Delilah was nowhere to be found, although she was obviously somewhere in the house. 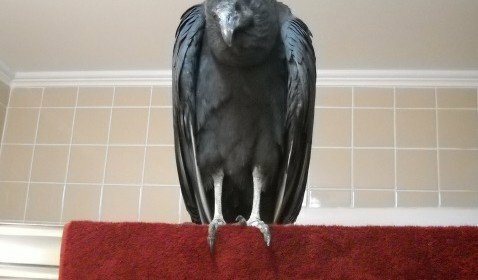 Not wanting to risk another shower flight attempt, I figured I’d just stick the vulture in Delilah’s empty enclosure, clean his crate, and put him back. No sweat, or so I thought. The vulture, an easy-going guy, was standing there minding his own business when Delilah came barreling out from behind the couch. She galloped up to her house, peered through the mesh, and performed a side-to-side, lemme-at-him cobra dance which I could only interpret as the rabbit version of slapping a glove against a potential opponent’s face. The vulture stared back at her, not moving a muscle. Delilah is now almost nine years old, Skye is in college, and I see no signs of diminishing rabbit capacity. She fears neither oversized canines nor dark, hunched birds with hooked beaks. Is all this my own fault? Should I have called a rabbit wrangler the second she started riding roughshod over our 120-pound dog? I suppose it’s too late for regrets; we’ve ended up with Attila the Bun, and all who enter here are going to have to look out for themselves. Love your post! Your daughter, rabbit, and vulture are all lucky to have you! Buns are NOT fond of finding others in their homes!! My friend’s bunny has chased her cats out with severe prejudice; no sharing by him, lots of sharing by THEM! The bunny is gorgeous. The black vulture IS adorable; I also like vultures! Just loved reading this, thank you for sharing, wonderful….. Thanks for your comments! We’re working on Delilah’s bad rabbitude, so far with no success. Awesome story! Bad rabbitude or not… she got to live with real purpose for her remaining days in this realm. Thank You. That would be “extreme prejudice” to be precise…as in Francis Ford Coppola’s adaptation of Joseph Conrads’s novel “Heart of Dadkness” wherein Cpt. Martin Sheen is given orders to terminate Col. Kurtz’s command with “extreme prejudice!” Nothing like a good euphemism to set the right tone for the task at hand! Where Are You Birding This Third Weekend of October 2013?